Well, more than 66,000 of them, anyway. What they’ve said is that Toyota and General Motors provide the best combination of product satisfaction and lower-than-expected ownership costs in nearly half the categories of the 2015 Motorist Choice Awards by IntelliChoice and AutoPacific research companies. 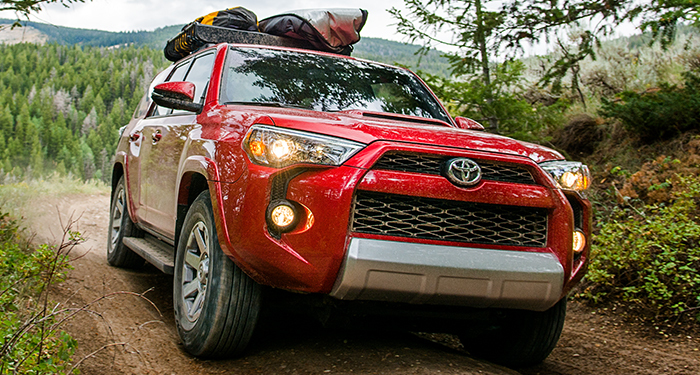 Motorist Choice Award winning 4Runner helped Toyota win big. “The Motorist Choice Awards are significant because the vehicles are rated by new car buyers on 50 key attributes,” said Mike O’Brien, vice president of corporate and product planning for Hyundai Motor America, which scored two category winners. In all, the awards recognized 23 winners from 13 brands and 10 manufacturers. Toyota’s six winners, including luxury brand Lexus, by category are Avalon HEV (large car), Lexus ES 300h (luxury mid-size car), Lexus CT 200h (premium compact car), Lexus RX (luxury crossover SUV), Highlander (premium mid-size crossover SUV) and 4Runner (mid-size SUV). In contrast to Toyota’s diversity of winning vehicles, General Motors “cornered” the truck segment with five winners – the GMC Acadia (large crossover SUV), Cadillac Escalade (luxury SUV), Chevrolet Tahoe (large SUV), GMC Sierra HD (heavy-duty pickup) and GMC Canyon (compact pickup). The remaining Motorist Choice category wins went to Honda with three, Hyundai and BMW with two each, and Volvo, Subaru, Volkswagen, Mazda and Ford with one win each. They are Honda’s Fit (economy car), CR-V (mid-size crossover SUV) and Odyssey (minivan); Hyundai’s Veloster (sporty car) and Tucson (compact crossover SUV), and BMW’s 5-Series (luxury car) and X5 (premium luxury crossover SUV). Also, the Volvo XC70 (aspirational luxury car), Subaru Legacy (mid-size car), VW Golf (compact car), Mazda MX-5 (sports car) and Ford F-150 (light-duty pickup). The winners include seven all-new vehicles – the Escalade, Tahoe, Canyon, F-150, Fit, Legacy and Golf. The Motorist Choice Awards combine AutoPacific consumer survey data, which comprises feedback from more than 66,000 new vehicle buyers, with IntelliChoice cost-of-ownership data, which tracks metrics for more than 2,000 model trim lines over a five-year period. Details of the Motorist Choice Award results are available online at autopacific.com.